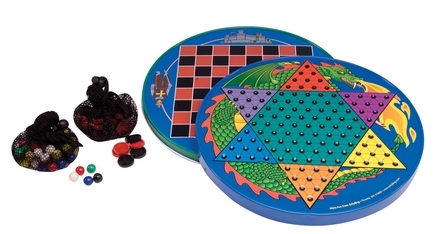 The Chinese checker game features 2 games in one! Made of tin, the board has Chinese checkers on one side and checkers on the other! Measures 12.5" x 12.75" x 1" Ages 5 & up. WARNING: CHOKING HAZARD Small parts. Toy contains a small ball. Not for children under 3 yrs. Measures 12.5" x 12.75" x 1" Ages 5 & up. WARNING: CHOKING HAZARD Small parts. Toy contains a small ball. Not for children under 3 yrs.